Here is an awesome book bringing to life a man I have wanted to know ever since I heard he was a role model of Ronald Reagan. Shales was a good biographer who stepped out of the way and let us know Cal. 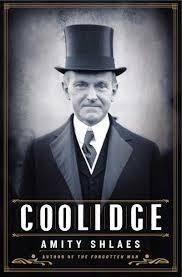 In her deft hands, the simply telling the story helped us see that Coolidge was a good man. He was ever motivated by principle and was, perhaps, the least politician who ever sat in the office. He was a hard worker, and especially tireless in going after budget cuts. The country and the economy thrived in his time in office. Shales shows us his full orbed personality. He likely was a little harsh at times. His moniker of “Silent Cal” was no exaggeration. He was a little jealous of his beautiful wife too, but he clearly adored her. Shales related one strange episode where his wife and a secret service agent got lost hiking. He exploded and the agent was transferred. It did seem he was at least a nominal Christian. He seemed to be the perfect President for his times and you wonder if he would have done quite as well at other times. He handled the Boston Police Union strike in such a way that perhaps he could have well handled a major foreign policy crisis, but we will never know as he was spared that in his term. I did get the feeling that he would have better handled the Depression than Hoover, as he fully realized the market was overvalued in his day. I came to really like this man and came to love this biography along the way too. This is a real winner. Read all in the presidential series here.